Round columns, a barrel vaulted entrance, and arched windows bring instant elegance to this three bedroom family home with bonus room. 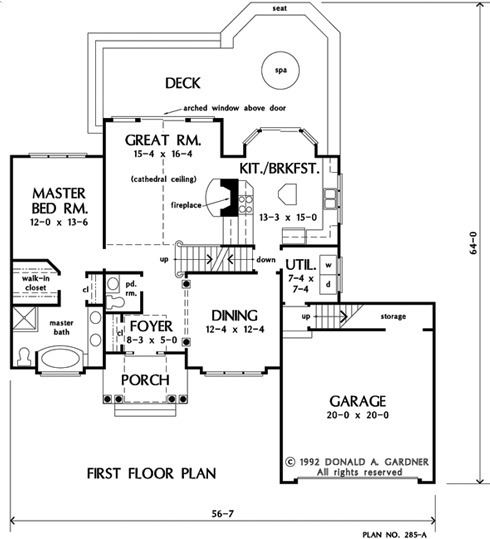 Little space is wasted in this open plan due to a strategically placed foyer that opens to all areas of the home. Interior columns add a touch of class and separate the dining room from the foyer, and a cathedral ceiling in the large great room with arched clerestory window continues the drama. Conveniently located for easy entertaining, the kitchen/breakfast bay with island is adjacent to the dining room, the great room, and the rear deck. The master bedroom with private bath features lavish amenities and ample closet space. 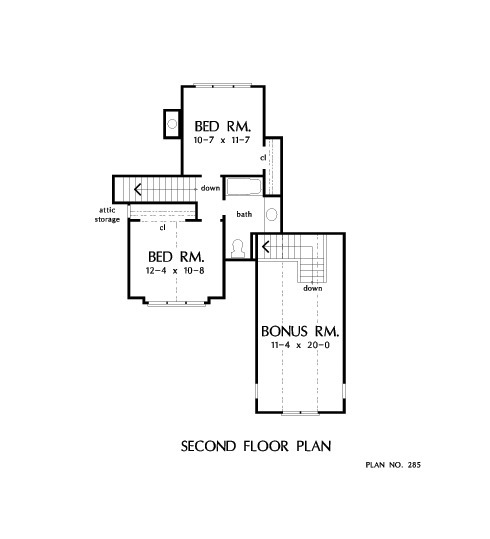 Two bedrooms and a full bath are located on the second floor. 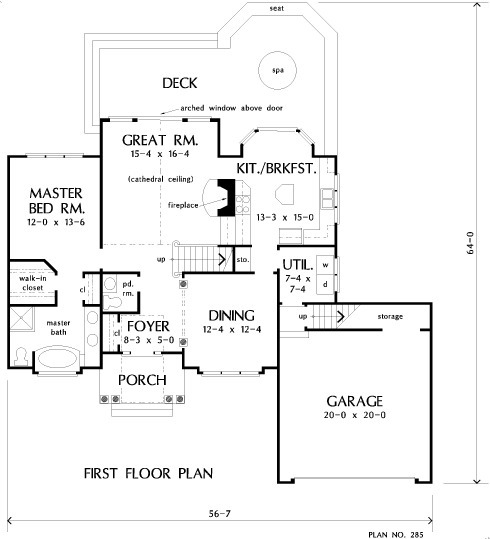 1st Floor: 1288 Sq. Ft. Bonus Room: 289 Sq. Ft.
House Dimensions: 56' 7" x 48' 8"
Master Bedroom: 12' 0" x 13' 6"
Foyer : 8' 3" x 5' 0" x 8' 0"
Great Room (Cathedral): 15' 4" x 16' 4" x 16' 0"
Kitchen : 13' 3" x 15' 0" x 8' 0"
Bonus Room : 11' 4" x 20' 0" x 8' 0"
Garage Storage : 12' 4" x 3' 2" x 0' 0"
Master Bedroom : 12' 0" x 13' 6" x 8' 0"
Bedroom #2 (Cathedral): 12' 4" x 11' 2" x 12' 6"
Bedroom #3 : 10' 7" x 11' 2" x 8' 0"
Porch - Front : 10' 7" x 6' 8" x 0' 0"
Deck / Patio : 31' 7" x 15' 4" x 0' 0"
Storage (Other) : 2' 3" x 3' 3" x 0' 0"